Salmonella, E. coli, Listeria, oh my! Like the chant from the beloved children’s movie, these bacteria are on the horizon and we need to be cautious of coming in contact with them. The common bacteria we hear about in the news – Salmonella, Shigella, Escherichia coli, Listeria, and Campylobacter – can be dangerous when they leave their normal habitats and invade our kitchens or our food. We will look at each of the common pathogens and see where they are likely to be found. 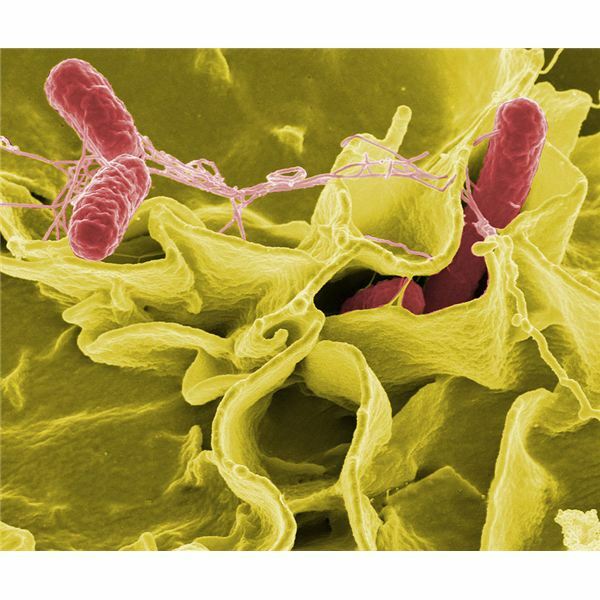 Salmonella is the most common cause of foodborne illness, commonly called “food poisoning." The bacteria comes from contaminated eggs, poultry, meat, unpasteurized milk or juice, cheese, contaminated raw fruits and vegetables. Animals such as reptiles (snakes, turtles, and lizards), amphibians (frogs), and birds (baby chicks) are also a source of the bacteria. In addition, pet food and pet treats have been found to be contaminated in the past. Salmonella causes diarrhea, fever, vomiting, and abdominal cramps for about a week. Shigella is spread from contaminated water, food, or persons. This is the bacteria that typically causes traveler’s diarrhea and diarrhea illnesses seen in schools and daycare settings. Foods typically associated with Shigellosis are salads and sandwiches that involved a lot of personal preparation. Additionally, raw vegetables that were contaminated in the field can be the cause. Shigellosis causes sudden abdominal cramping, nausea, vomiting, and diarrhea that may be bloody or contain mucus. Symptoms can last from two days to one week. Escherichia coli, or E. coli, lives not only in the intestines of animals, but in humans as well. Most types of E. coli are harmless; however, some types can make you sick. The most dangerous type of E. coli is the o157:H7 type which causes bloody diarrhea with severe abdominal pain and vomiting. Typically, little or no fever is present. This bacteria comes from animals and their environment, contaminated water, and contaminated food, such as undercooked ground beef, unpasteurized milk and juice, and raw fruits and vegetables. Symptoms can last from as little as one day up to one week. Severe complications, such as hemolytic uremic syndrome and kidney failure, typically occur after one week. Listeria is a bacteria found in soil, water, and some animals. It can be found in raw (unpasteurized) milk and in food processing plants and processed meats. This bacteria is different than most germs because it can grow in the refrigerator. This bug is especially dangerous for pregnant women because it can cause miscarriage and stillbirth. Symptoms of the infection include fever, stiff neck, confusion, weakness, vomiting, and sometimes diarrhea. This illness lasts from a few days to a few weeks. Wash your hands after diapering babies, using the restroom, or touching animals at home or in petting zoos. Wash your hands before food preparation. When preparing foods, keep utensils used with uncooked foods away from vegetables, fruits, and cooked foods. Do not eat foods that are unpasteurized, such as raw milk, cheeses made with raw milk, or juice. Do not eat uncooked or undercooked ground beef or poultry. Additionally, use a meat thermometer and cook ground beef to a temperature of 160 degrees Fahrenheit because color is not a reliable test of doneness. Most of these bacteria cause illnesses that are self-limiting. However, consult your physician to be safe. This is especially true for pregnant woman because antibiotics can be used in the treatment of Listeriosis. Drink plenty of fluids to remain hydrated. Cleanliness is definitely next to healthiness.